Engines: Four 16-cylinder Normo-Gruppen A/S diesels. January 26th 1974: Launched as CORD ADELER. June 6th 1974: Delivered to A/S Larvik-Frederikshavnferjen, Larvik, Norway. 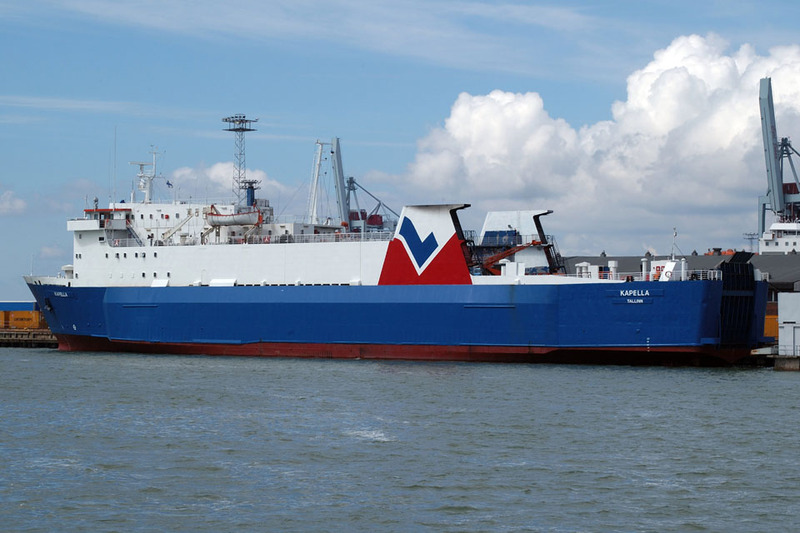 June 9th 1974: Chartered to Norfolk Line, Scheveningen, Holland. Renamed DUKE OF YORKSHIRE. June 11th 1974: Commenced services between Scheveningen – Middlesbrough. 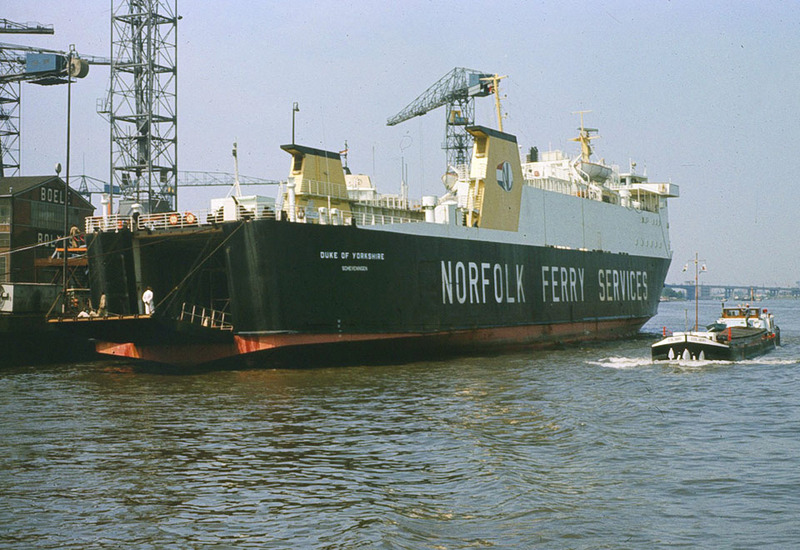 October 14th 1975: Transferred to the Dutch ships register. November 15th 1975: Sold to Unilever Norfolk Line, Scheveningen, Holland. 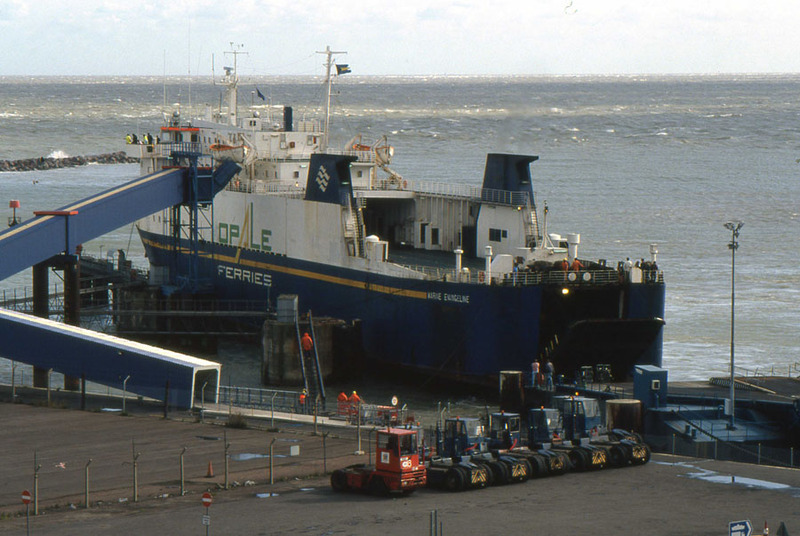 June 28th 1976: During a journey from Teesport to Esbjerg suffered an engine-room fire. 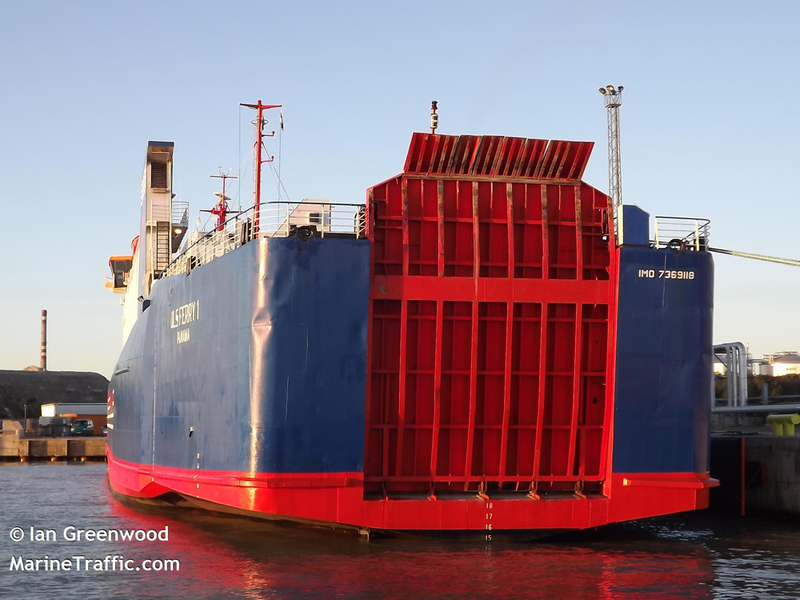 Towed to Rotterdam for repairs. June 30th 1976: Arrived in Rotterdam. Repairs took seven weeks. 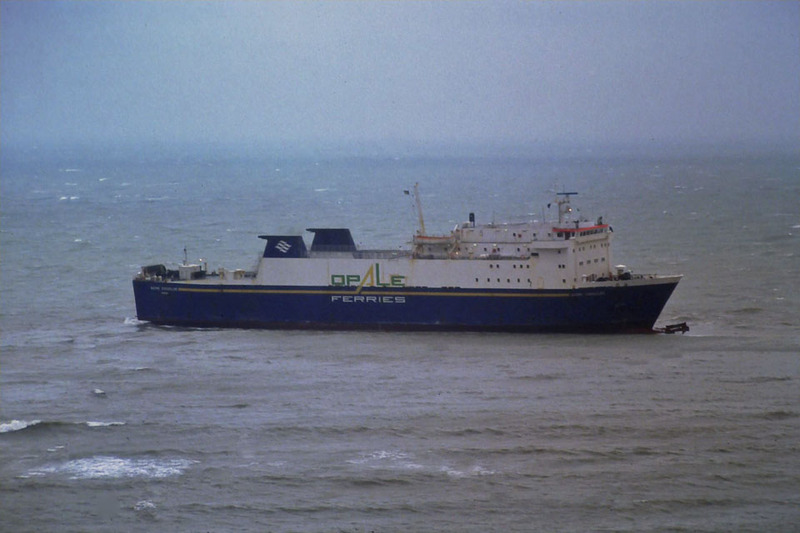 January 1977: Chartered to P&O Normandy Ferries for two weeks. 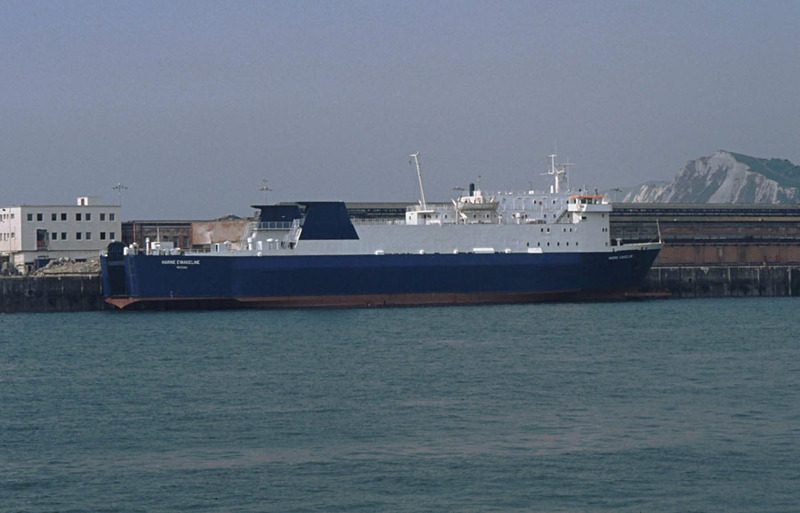 Operated Dover – Boulogne. 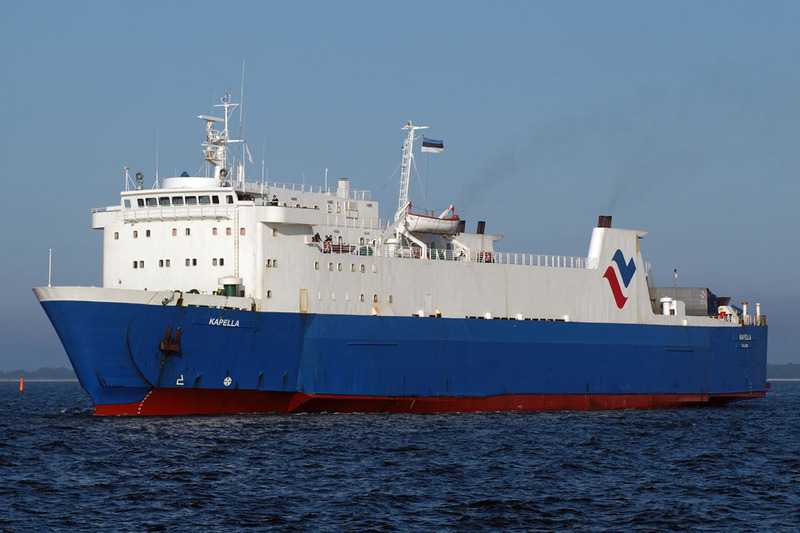 January 1977: Chartered to an unknown shipping company and began operations Sheerness – West Africa. March 1978: Sold to CN Marine, Halifax, Canada. Left Rotterdam for St John for conversion at a Newfoundland Dockyard. 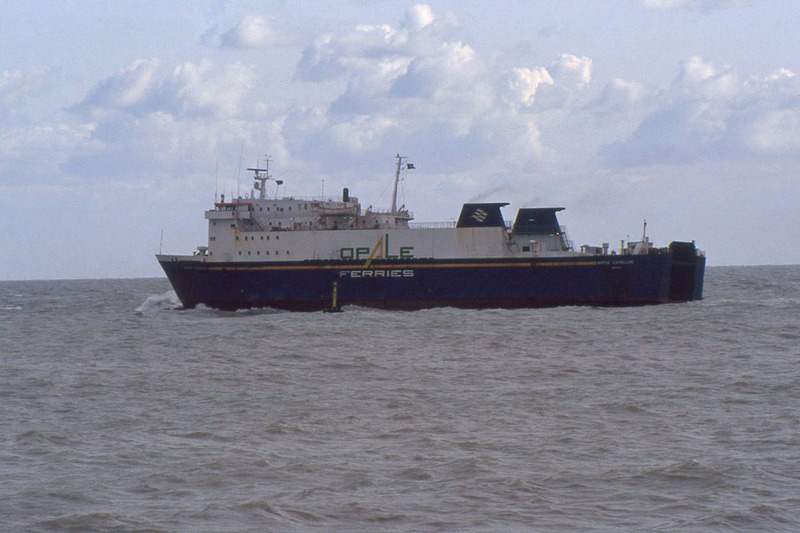 March 1978: Renamed MARINE EVANGELINE. Registered to Royal Lease, Ltd, Yarmouth, Canada. 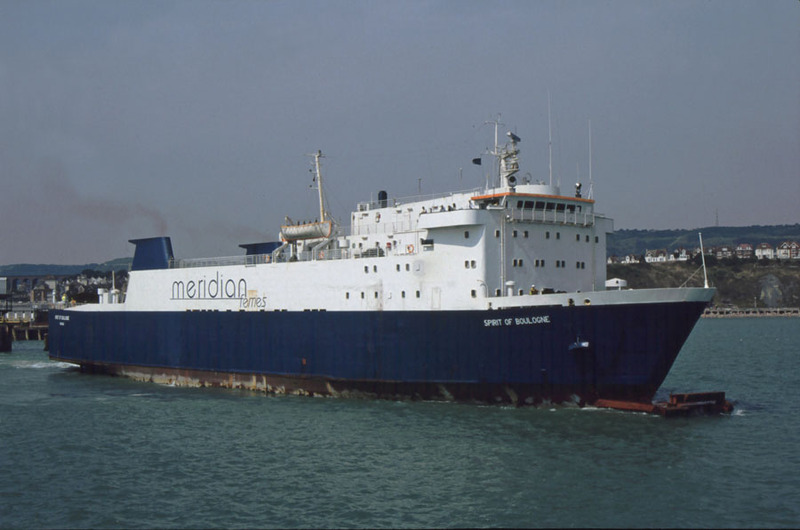 April 1978: Inaugural sailing Yarmouth – Portland. March 30th 1983: inaugural sailing Yarmouth – Bar Harbour. December 8th 1985: Left North Sydney for Dieppe. 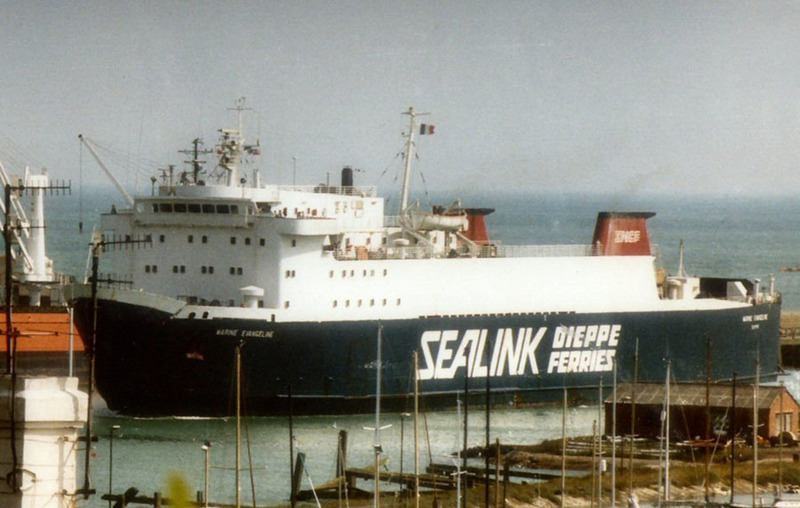 December 23rd 1985: Arrived Dieppe. 1986: Registered to CN Marine Inc, Yarmouth, Canada. 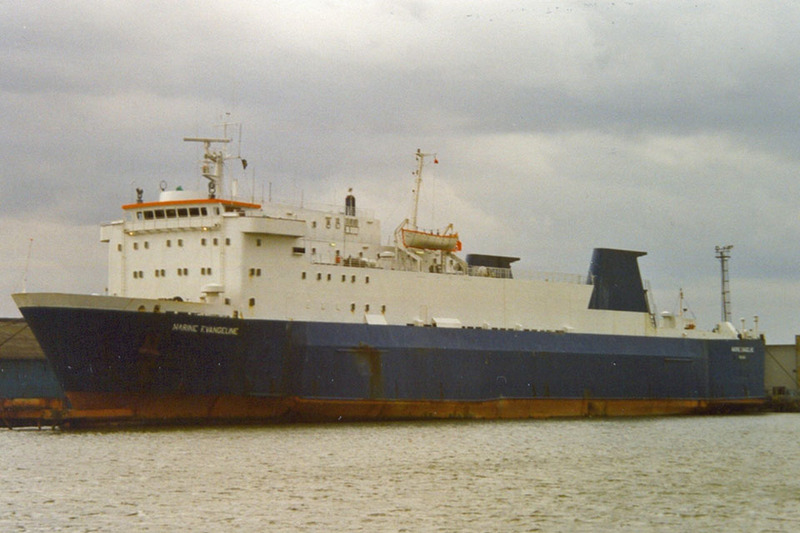 1986: Registered to Marine Atlantic Dieppe, France. 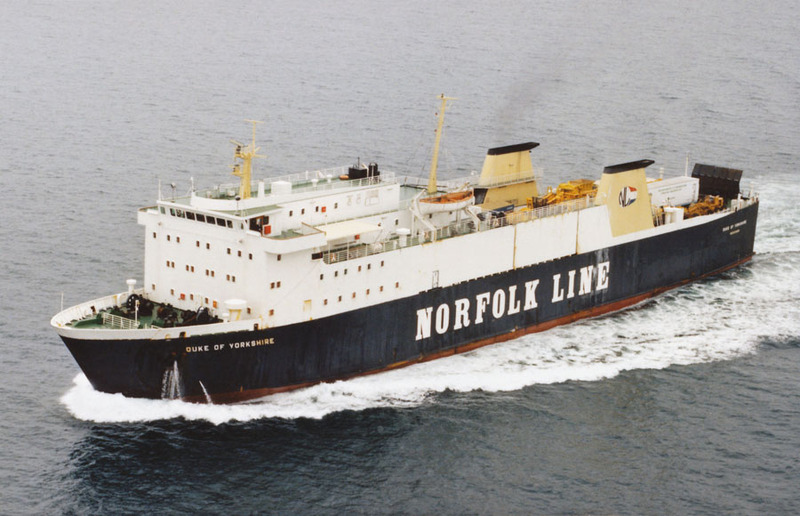 April 24th 1986 – April 24th 1986: Chartered to Dieppe Ferries (SNCF) for services between Dieppe – Newhaven. April 24th 1986 – April 29th 1986: Laid up in Dunkerque. 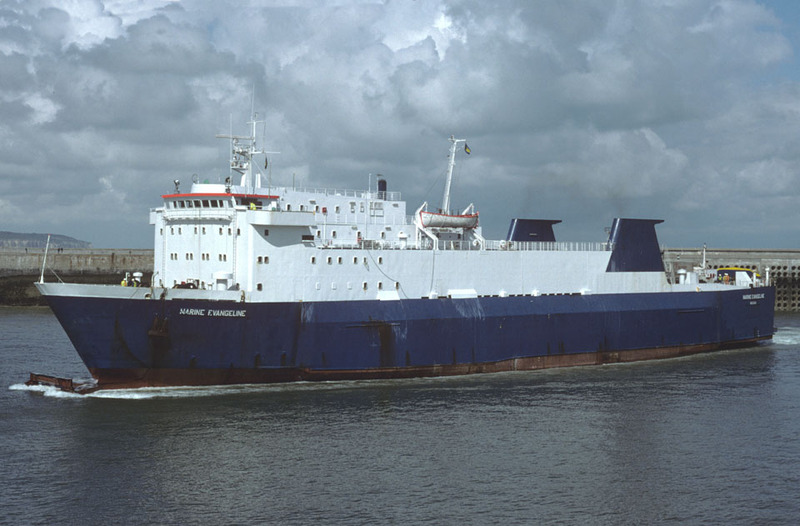 May 2nd 1986: Chartered to RoRo Ferries, commenced operations between Rosslare – Pembroke Dock. 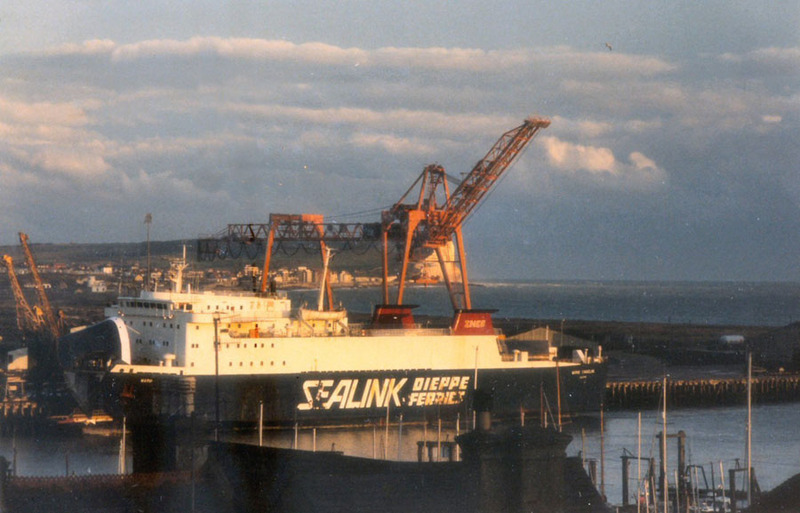 December 1986: Chartered to Dieppe Ferries (SNCF) for services between Dieppe – Newhaven. September 22nd 1988: Arrived St John, Newfoundland for further lay up. 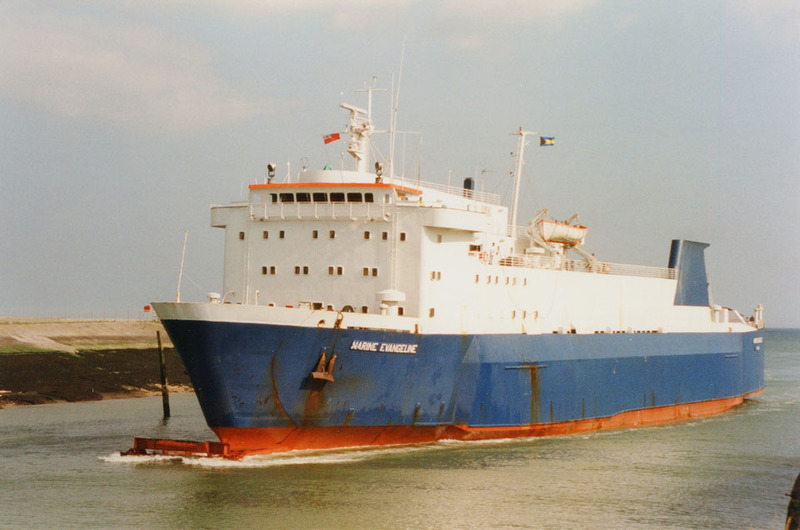 1989: Commenced operations for Marine Atlantic. 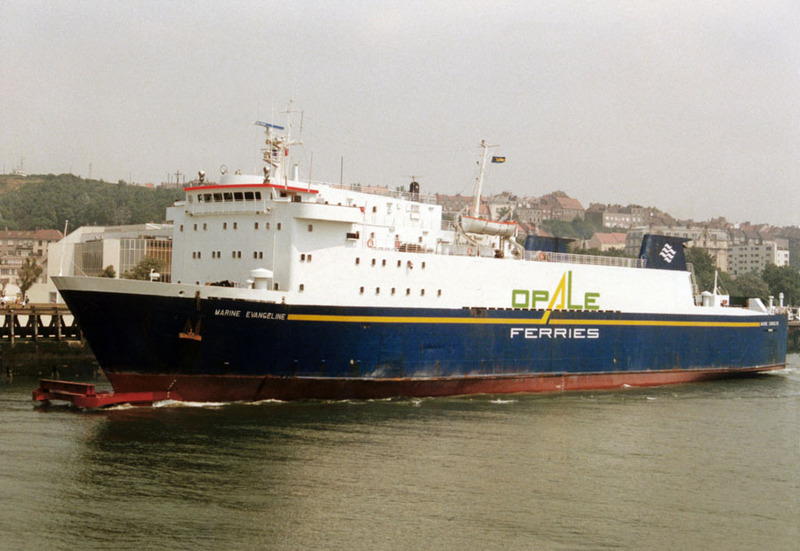 1992: Chartered to Opale Ferries, Boulogne, France. Inaugural service Boulogne – Folkestone. 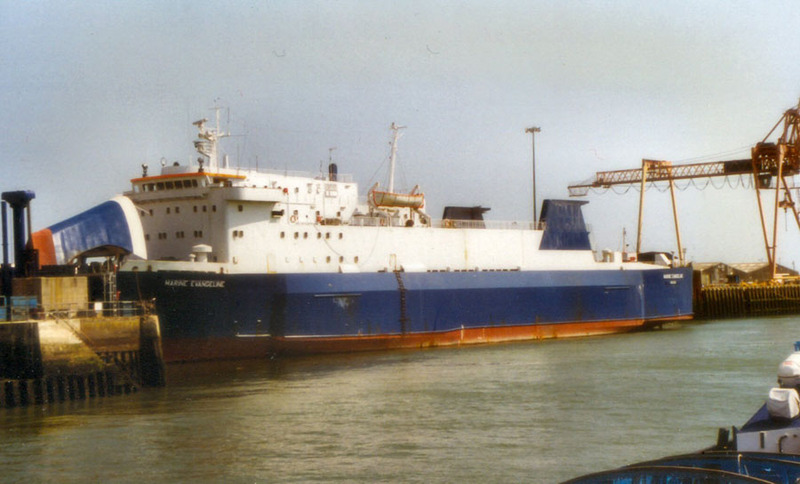 July 1992: Underwent berthing trials at Ramsgate. 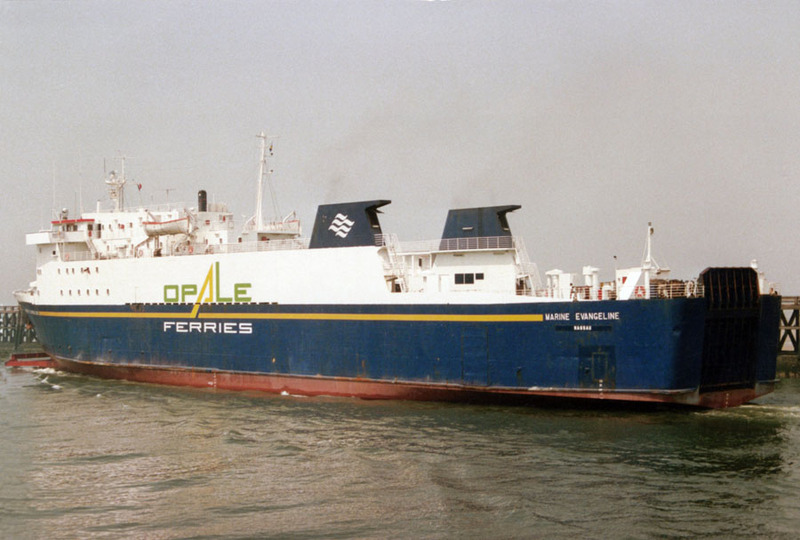 July 4th 1993: Opale Ferries went bankrupt. 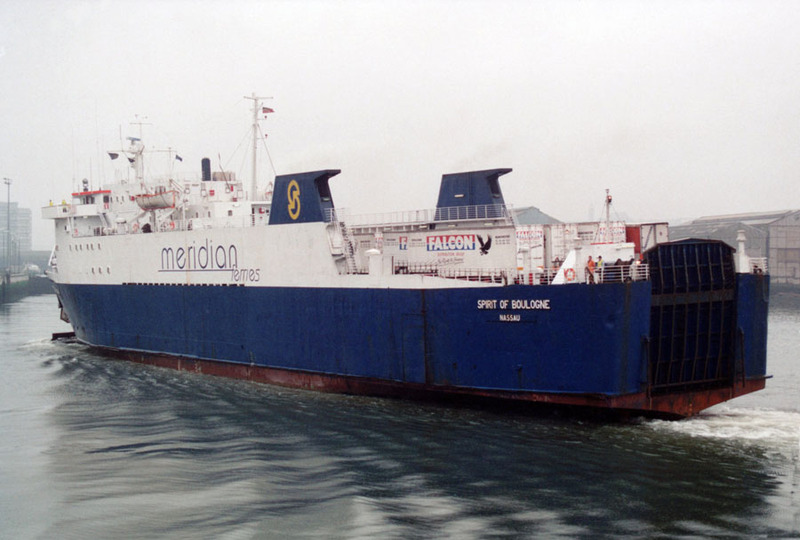 July 4th 1993: Chartered to Meridian Ferries, Folkestone, England. 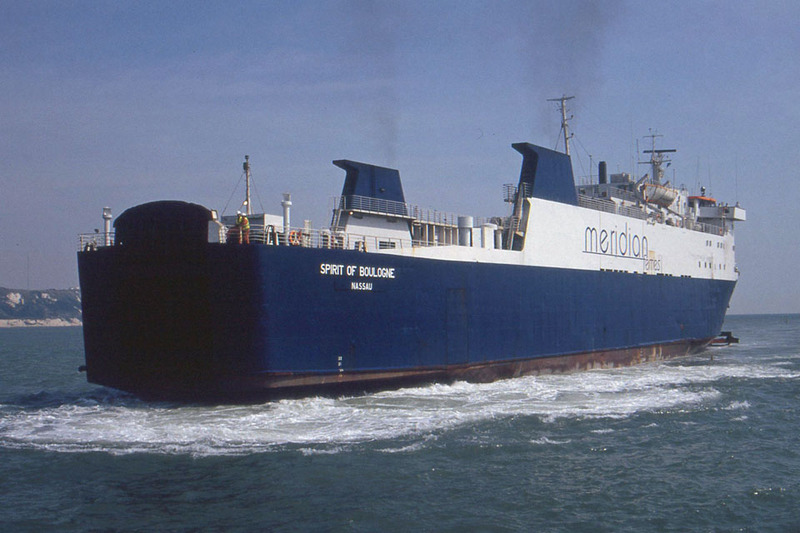 Renamed SPIRIT OF BOULOGNE. Transferred to Bahama flag, home port Nassau. 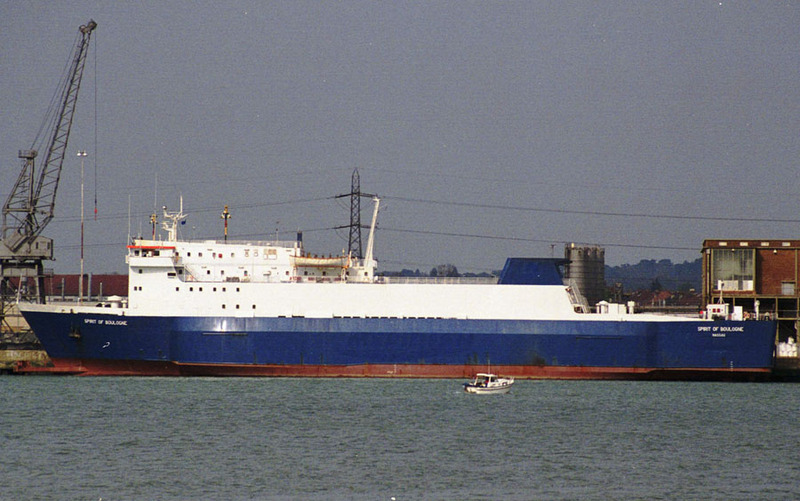 July 4th 1993: Inaugural sailing Folkestone – Boulogne. 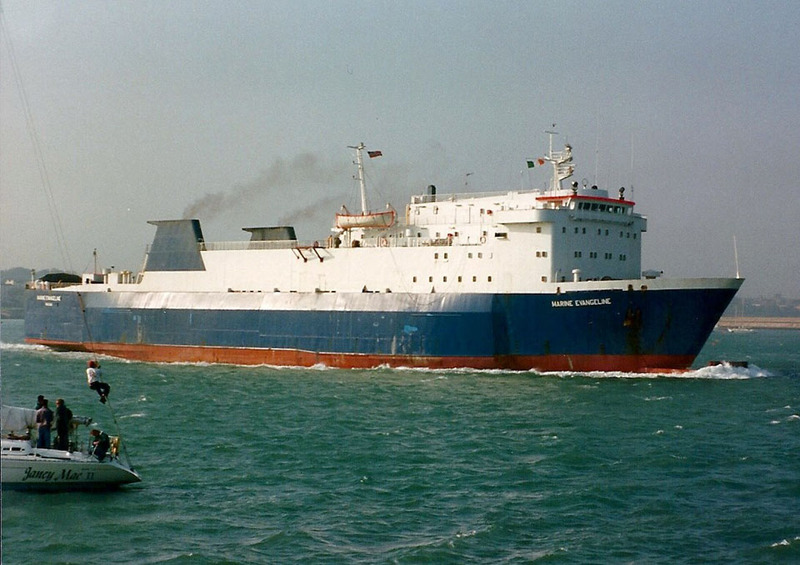 July 5th 1994: Ran aground near Boulogne. 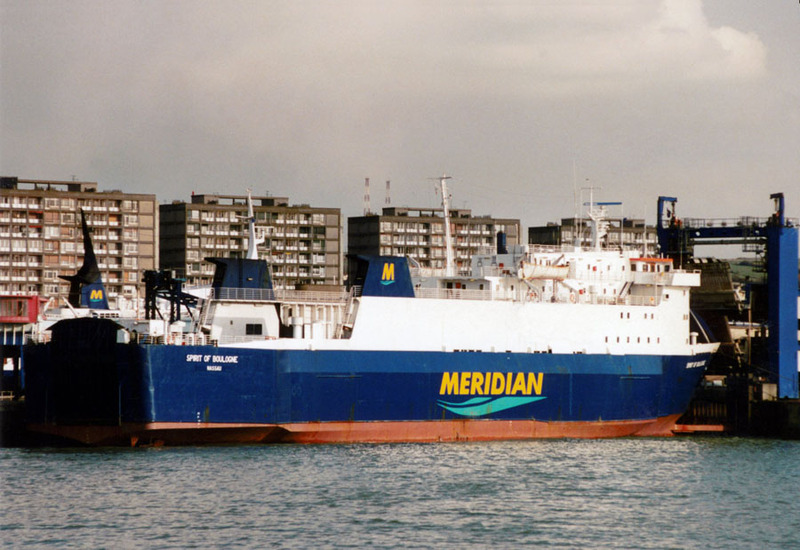 March 15th 1995: Meridian Ferries went bankrupt and she was laid-up in Boulogne. 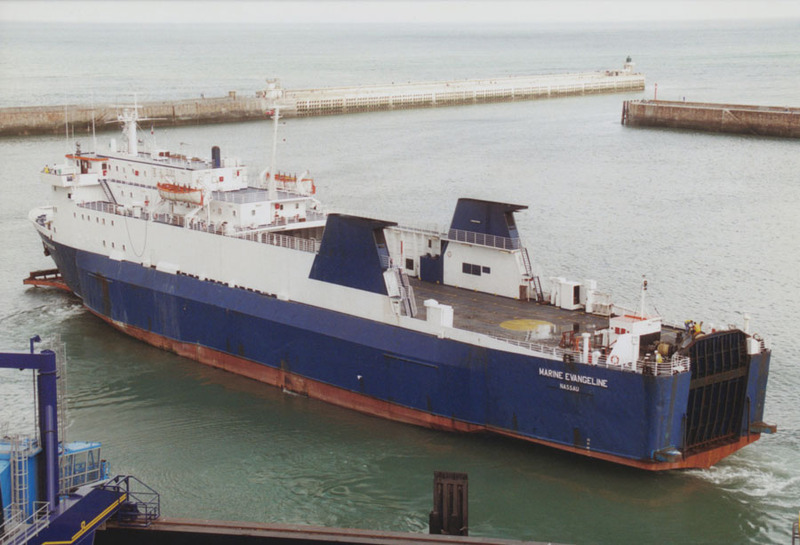 1995: Returned to Marine Atlantic, laid up in Dover. Renamed MARINE EVANGELINE. 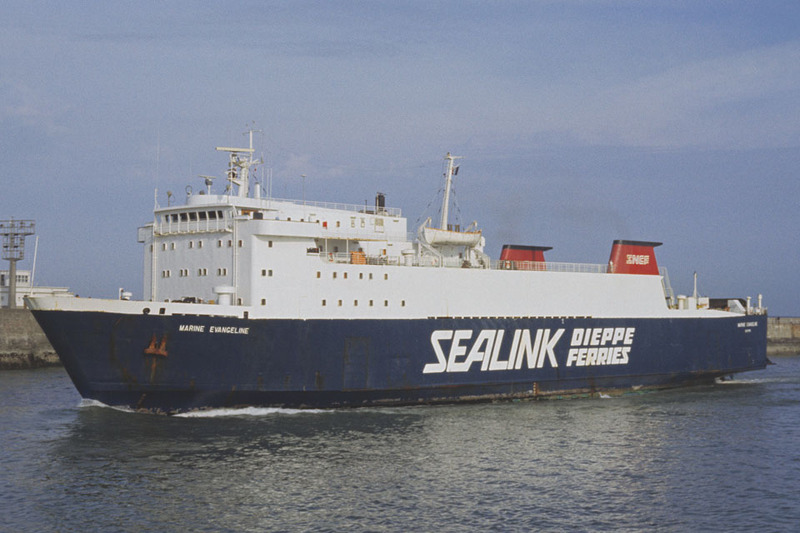 June 21st 1995: Chartered to Sealink Stena Line, commenced services between Newhaven – Dieppe. 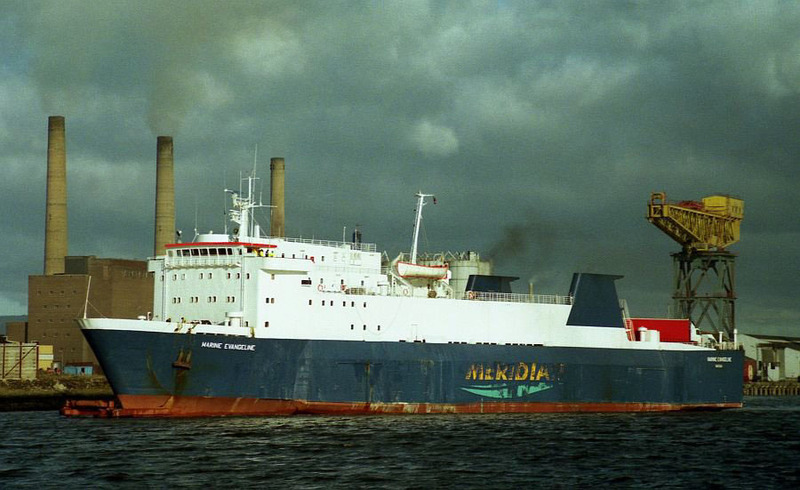 October 6th 1995: Dun Laoghaire – Holyhead replacing STENA CAMBRIA. 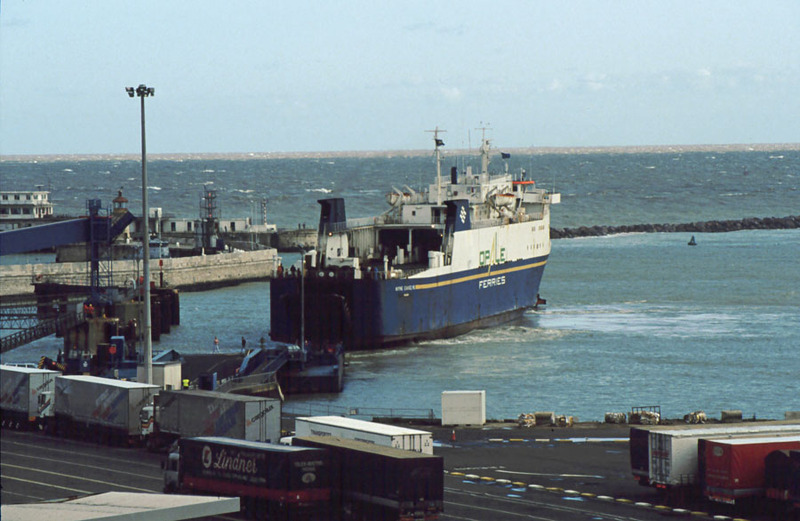 October 13th 1995: Opened new freight ferry service between Holyhead – Dublin. 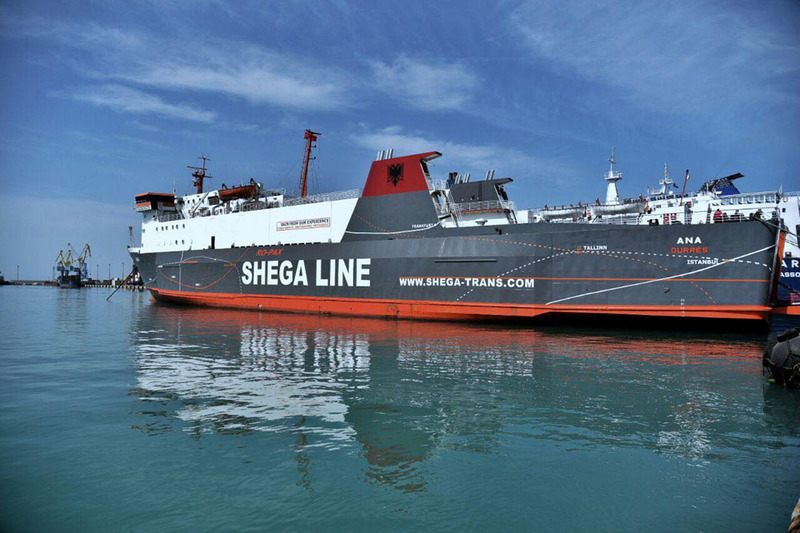 Service taken over by STENA TRAVELLER. 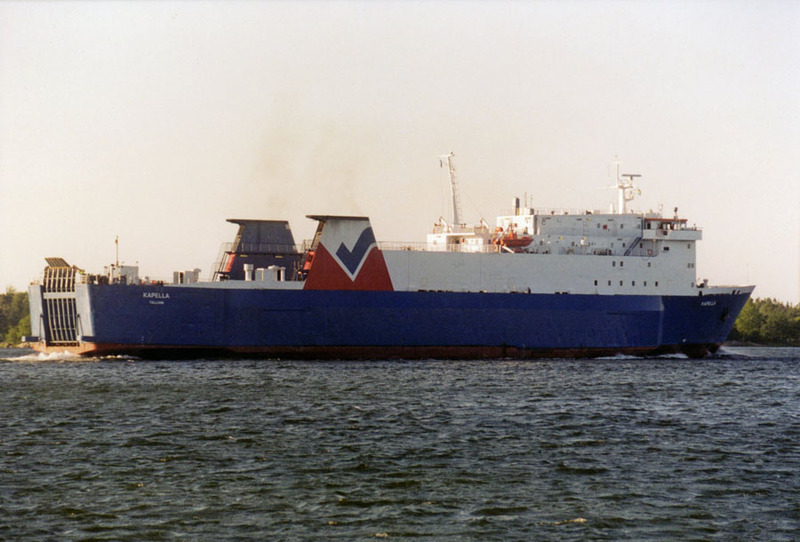 November 1995: Inaugural sailing between Stranraer – Belfast. 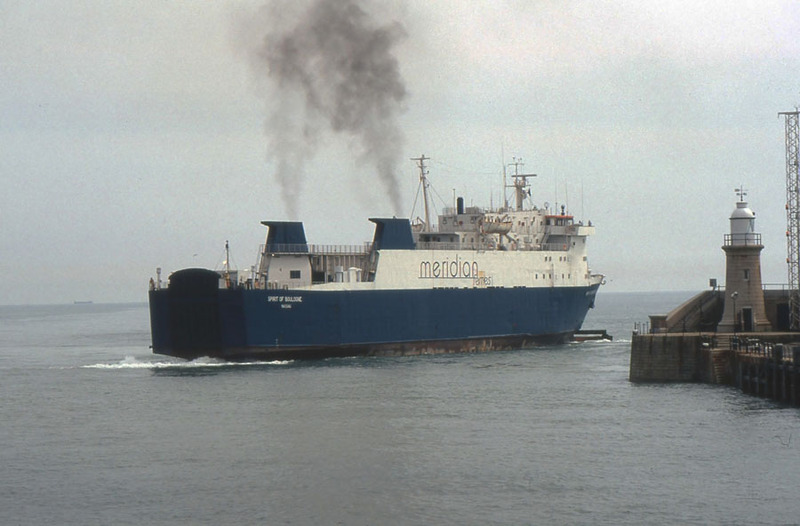 April 2nd 1996: Began operations Newhaven – Dieppe. 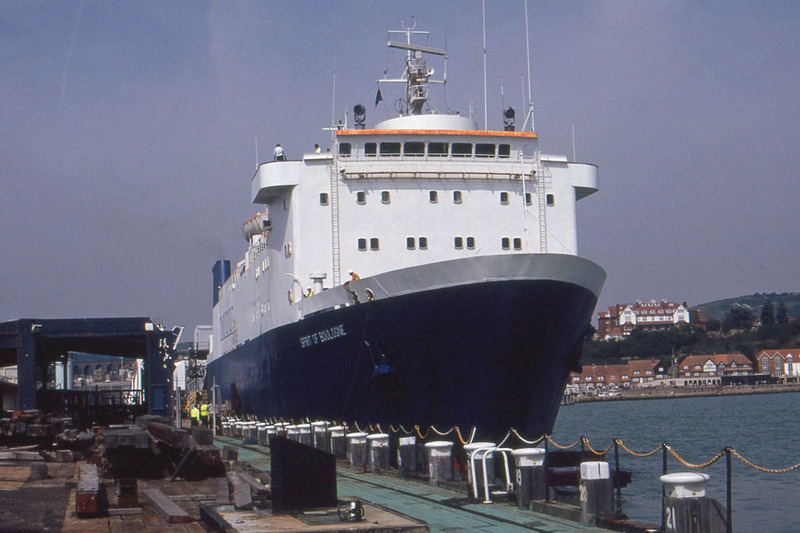 October 1996: Charter completed and initially laid up in Southampton. Then sailed to Hull to continue lay-up. 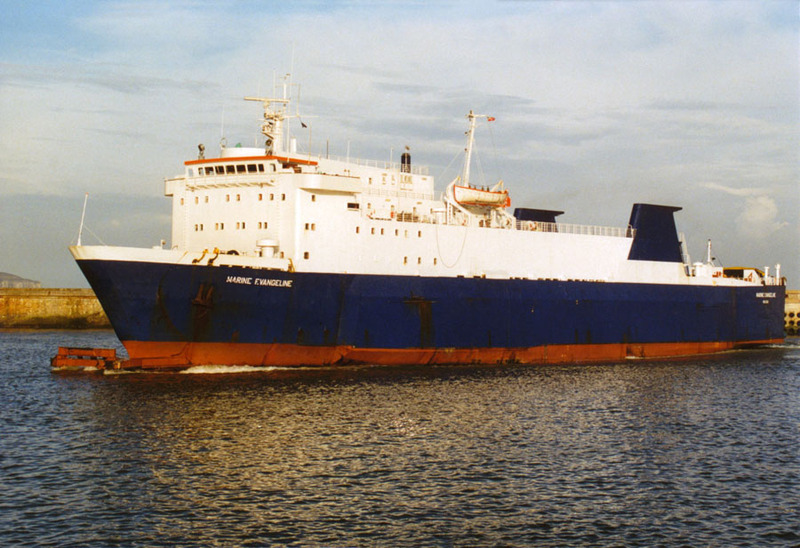 October 1997: Chartered to Hansatee Oy, Tallinn, Estonia. 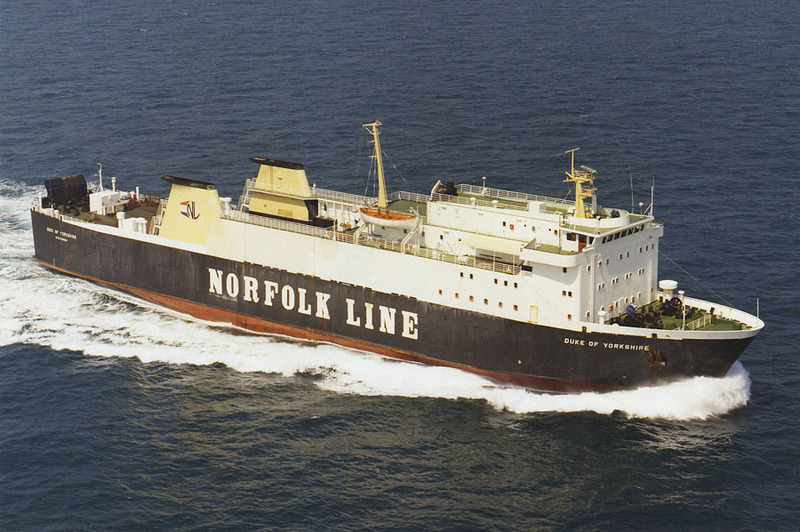 October 31st 1997: Inaugural sailing for Tallink between Kapellskär – Paldiski. August 1998: Sold to Hansatee Oy, Tallinn, Estonia. Renamed KAPELLA. 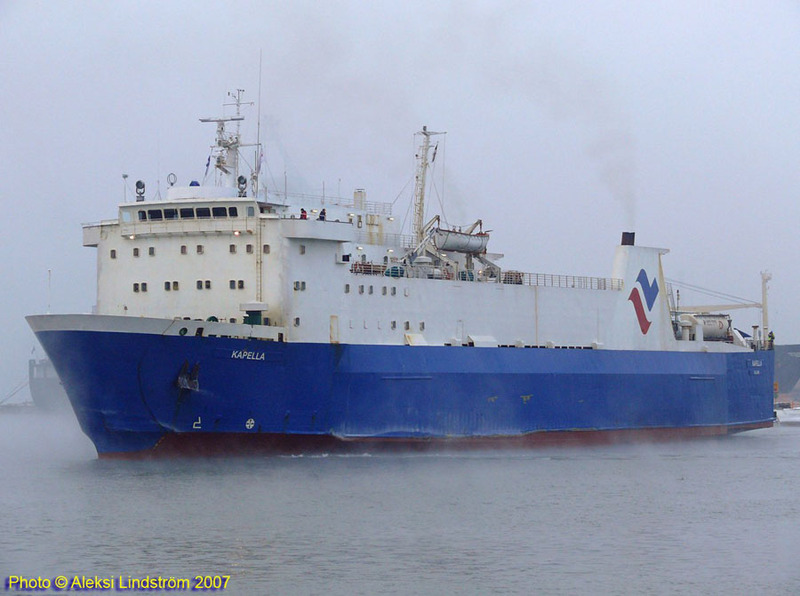 December 1998: Suffered an engine-room fire whilst arriving at Kapellskär. January 1999: Returned to service. 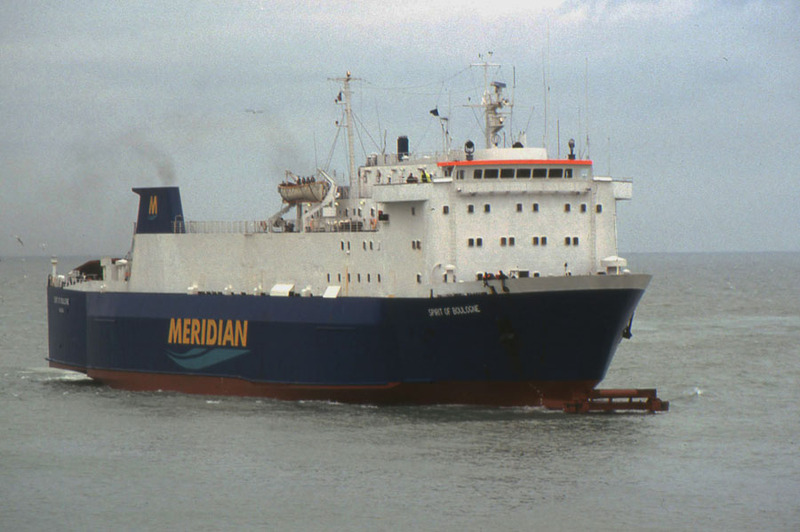 March 2004: Inaugural sailing between Tallinn – Helsinki. March 2006: Inaugural sailing between Paldiski – Kapellskär. January 2007: Commenced services between Tallinn – Helsinki. April 2007: Commenced services between Paldiski – Kapellskär. October 2008: Laid up in Paljassaare (Lahesoo anchorage), Tallinn. June 5th 2010 – September 1st 2010: Commenced services between Paldiski – Kapellskär. October 31st 2010 – 2011: Services between Paldiski – Kapellskär. 2011: Laid up in Tallinn. June 21st 2011 – August 31st 2011: Services between Åbo – Kapellskär. October 17th 2011 – October 28th 2011: Chartered to Rederi Ab Lillgaard, Åland for services between Långnäs – Nådendal. October 29th 2011: Laid up in Tallinn. 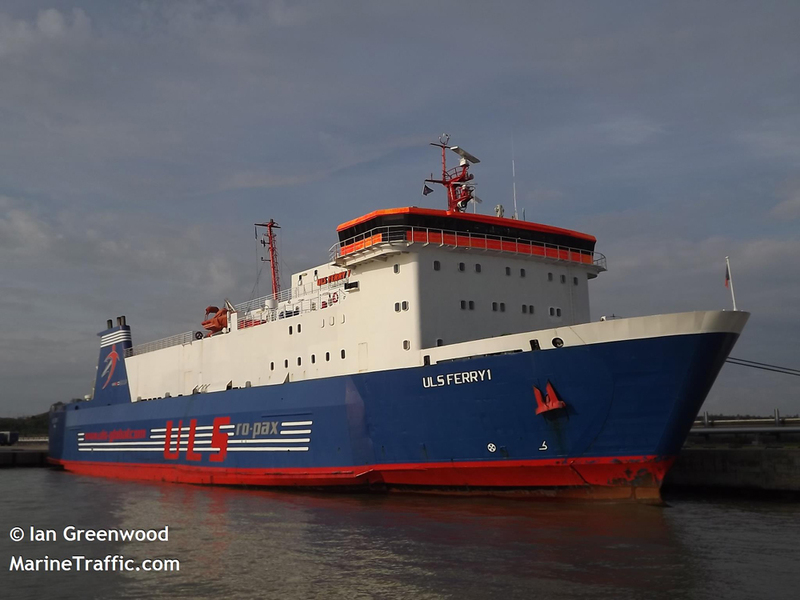 August 3rd 2012: Sold to Kapella Shipping Ltd, Panama and renamed ULS FERRY 1. 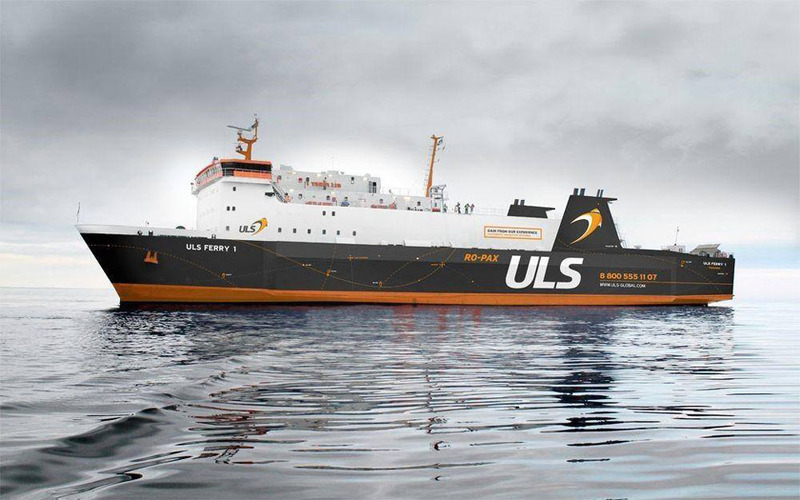 September 2012: Commenced services for ULS Global between Sillamäe – Ust-Luga. 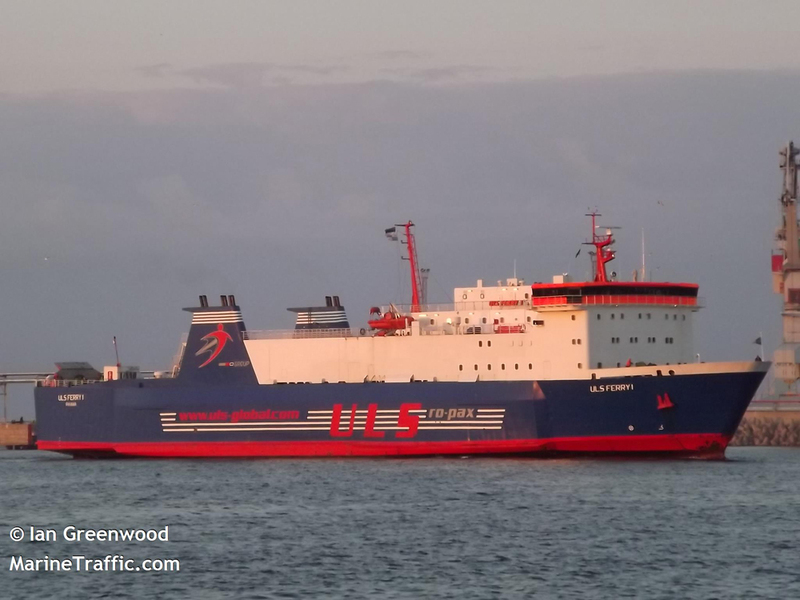 January 2016: Still in service between Sillamäe – Ust-Luga for ULS Global. 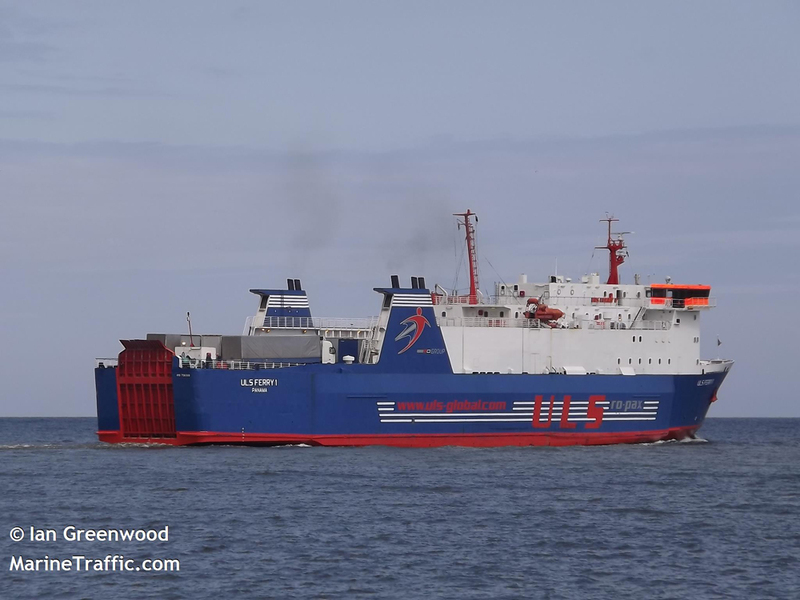 June 12th 2017: Advertised “For Sale” (Ship-Broker.EU). 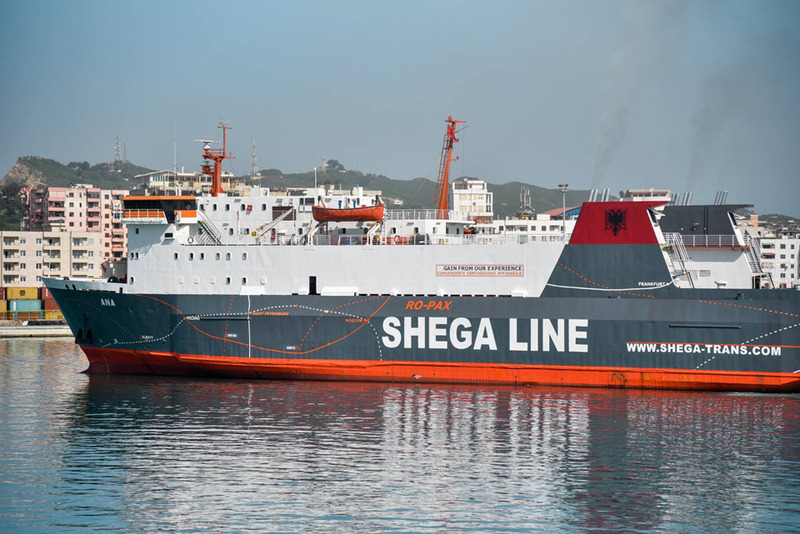 November 12th 2017: Sold to Shega Trans SA, Tirana, Albania and renamed ANA. April 2018: Left Tallinn for Albania. May 4th 2018: Arrived in Ravenna. Inspected and found to have 23 deficiencies. Impounded by Coast Guard. All information is believed to be correct and no responsibility is accepted for any errors or omissions found. All items included in this article are subject to © copyright. We would like to take this opportunity of thanking: Peter Bailey MBE, Tony Garner, Alan Geddes, Andy Gilbert, Frank Heine, Ron Hutchins (Courtesy of Derek Sands), Ken Larwood, Nicolas Levy, Aleksi Lindström, Frank Lose, Dave Rimmer, Simonwp, Robert J Smith, Michael Woodland and Andreas Wörteler for their assistance in producing this feature. Special thanks to Micke Asklander (Faktaomfartyg) and Ian Greenwood.